Give your bar area a boost and introduce it to the Newark Brushed Bar Stool Black, a modern model with simple and subtle beauty. Adding a touch of luxury to any contemporary kitchen or bar space, the Newark Brushed Bar Stool is a truly charming choice. Artfully fusing fashion and function, this clever product draws much of its appeal from its black faux leather seat. The mid-height backrest provides adequate support for your body. Both parts are lent shape and substance by the presence of high density foam within, which helps to create a sense of cushioning. The accompanying brushed steel frame counters this effect in typically muted fashion, and comprises a number of different features. While a variable height gas lift allows you to change the position of the seat, 360 rotation mechanism allows you to turn the seat with total ease, while the footrest remains fixed in place. 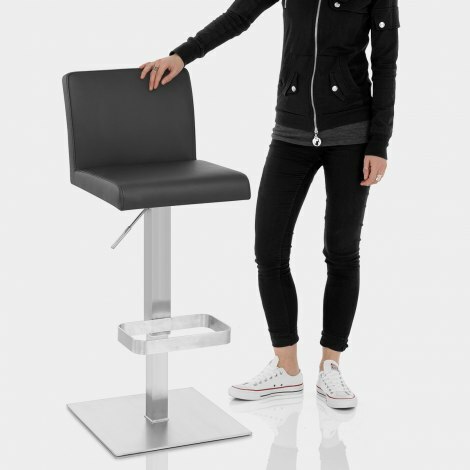 A firmly fixed rectangular footrest emerges from the body of the stool in order to help your legs to relax while finally, protective pads accompany the flat, weighted base, cementing the Newark's efficient and user-friendly appeal. "Very robust & good value"
The stools were delivered the next day. Very heavy! Very easy to assemble! Look amazing! Chuffed to bits! We have had 3 different bar stools before (always bargain). They were rubbish and fell apart after about a year. We saw these in a kitchen shop -they were props and not for sale. On sitting on them we immediately noticed how solid and comfortable they were. We ordered them on a Saturday night. They were delivered by the excellent DPD on Tuesday morning. After a bit of a fiddle putting them together they were as solid as when we first sat on them. The only problem was that when I started to put the last stool together I found that the screw packet was opened and 4 screws were missing. I phoned Atlantic shopping and they were brilliant -they got a new packet out that day and it was delivered the next morning. Everything about this company is slick and helpful. Very good value for money stools, robust construction & comfortable. there were no assembly instructions but we contacted Atlantic who responded quickly. Delivery was very prompt and as promised. We would certainly use Atlantic again.